That's just wonderful! I'm ready for Christmouse now! Wow, that would be a totally pawsome Christmas if you really got ALL those things, Daisy! MOL what a great way to start a Monday! That's a lot of loot!! We think Harley looks cute in the palm tree! MOL!!! 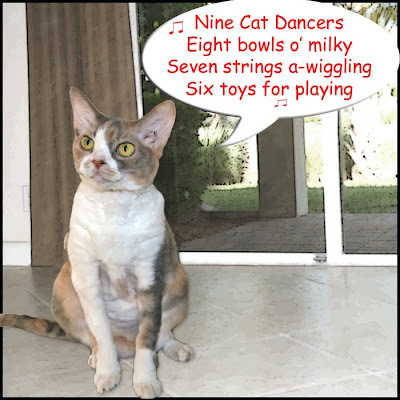 Purrfect wish list I think!! That's it. I'm never singing a partridge in a pear tree anymore. My new favorite lyric will be a Harley in a palm tree! No one will understand me, but it'll be our little secret! Daisy, we love that song especially the ending. Harley probably loves it in the Palm tree. Someone in your house Daisy is so clever. We would like all those things too. Purrfect list. Take care and have a super week. Bwahahahahaahahhahahaa!!!!! 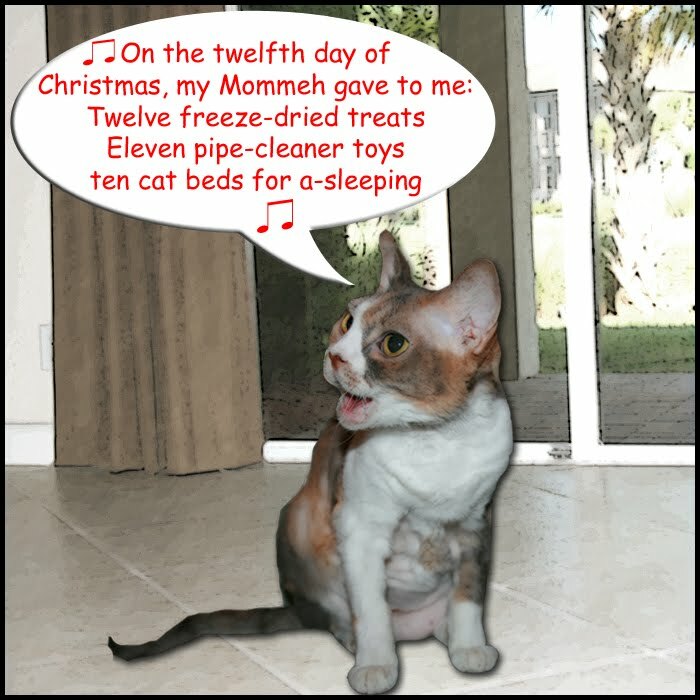 I Love the Twelve days of Catmas!!!!!!!! Clappity! Clappity! Pawsome song, guys. Wot a fabulous song! We love the "Harley in a tree" present the most! MOL! Haha! We love your version of that song!! BOL! Harley in a palm tree - that's so funny! i loled at "a Harley in a palm tree". ;) what a lucky girl you are! Hahahaha! I hope you don't have to call the fire department to get him down! We like the lyrics to your song, Daisy. 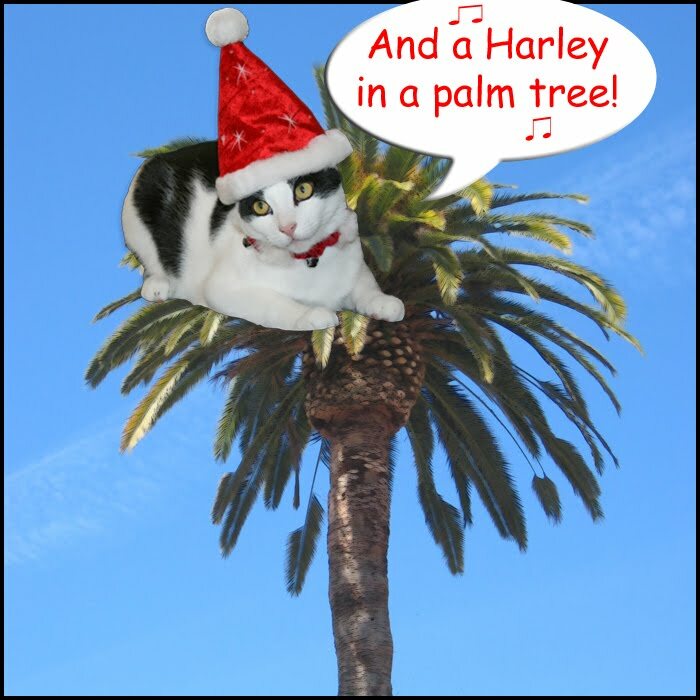 We think Harley will be the first cat to see Santa's sleigh from up in that palm tree! Now we feel really Christmassy. We hope you get everything you wish for. Don't get stuck in the palm tree Harley! Cool! How do we get a Harley in a Palm Tree? Oh Daisy! You have the best Christmas ever from your mommeh!! really pawsome and I know Harley loves being there! We loved your Twelve Days of Christmas! Bravo! YAY!!! That's so much better than Miles' carol Hammy Bells! I love your version, Daisy! So much better than the traditional version! I loves you Daisy and Harley, and I hope you have a wonderful wonderful Christmas! Awwww that is soo cute! Mummy laughed about Harley in the palm tree!!! "Harley in a palm tree" too funny!! Shall I call the fire department to get him down, or did you do that already? HARLEY! Watch out for the Coconut Crabs! Daisy, I like the way your mommeh thinks! That was clever..and don't you wish it were true! Wow! Harley looks good way up there. Umm...does this mean he can't get down and you are safe? Hahahahaha! A Harley in a palm tree....ahahahhahaha! That is a great song, Daisy. You are a very clever cat! Our favorite line is Three French Fries! We love your version of the song best Daisy. We loved all your things but especially Harley in the palm tree. (we hope he wasn't throwing coconuts down at people passing under his tree)!! This is one of the best versions ever. Well done, Daisy! At least Harley can't drive you nuts when he's at the top of the tree -- unless he drops coconuts on you, that is! I could use some palm trees and sun in my life right about now! MOL!!!!! What great gifts to get for the 12 days of Christmas! 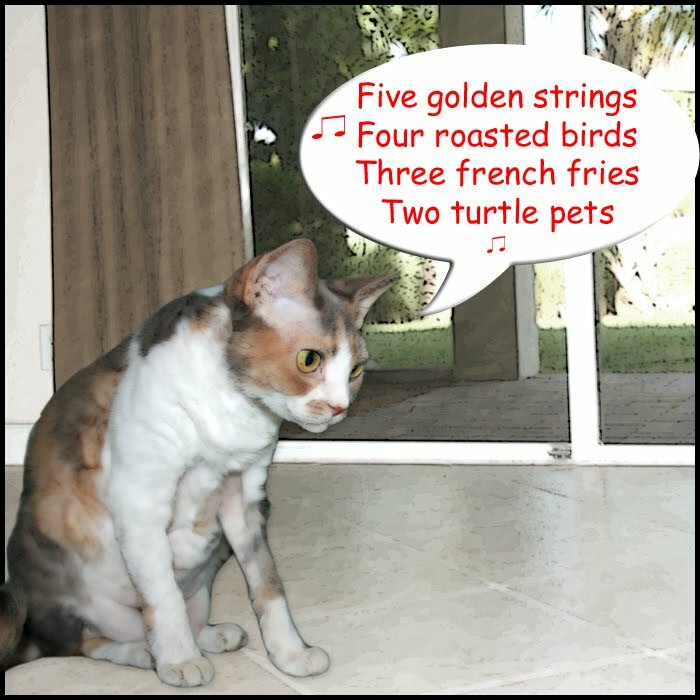 purrfect sing Daisy! I love your song. I bet Harley loves being up high in the palm tree too! You are lucky to have such a good mommeh! Our favorite, Harley in a palm tree! We'z been lissening to Krissmouse moosik too. Ha HA just wonderful kids! Singing Daisy, you are just too cute! I love the song. I especially love "Harley in a palm tree." LOL! Best song ever! I think I will sing it to my own cat "Spike". We love your song Daisy! We'd like to have all of that too but especially Harley in a palm tree! And that ain't all! I loved it! 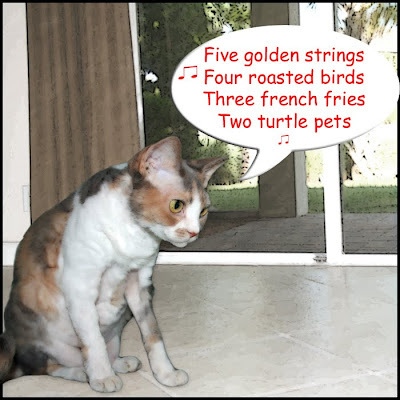 Ooh, I would like golden "STRINGS", but uh... Daisy, do you think 3 french fries will be enough for you? You might not want to share them with Harley...And how did Harley get all the way up that palm tree, anyway? Impressive! PS: There's a surprise for you at my blog on Monday's post. What a great Christmas song, Daisy! Purr-fect! Rats! We just now saw this! This is brilliant, Miss Daisy! Your mom sure gave you some cool stuff for the 12 days of Christmas. Our brother at the Bridge, Zachary, used to eat french fries - but only from McDonalds.